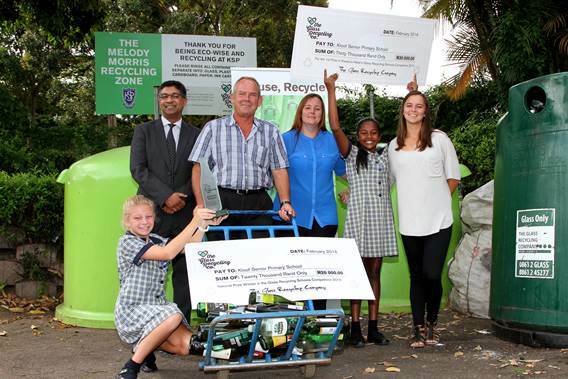 For a number of years, a new generation of eco-warriors has been emerging in our schools thanks to the efforts of The Glass Recycling Company (TGRC) and the Annual Glass Recycling Schools Competition. Seeking to educate young people about the importance of diverting glass from the country’s ever-expanding landfills, the contest invites learners with a green conscience to collect and recycle as many glass bottles and jars as possible, in the hope of winning a cash prize. This month has seen TGRC’s CEO, Shabeer Jhetam announce the winning schools in the Western Cape, KwaZulu-Natal and Gauteng for 2015. “The importance of glass recycling in our country’s efforts to reduce our carbon footprint cannot be overstated. By diverting glass from landfills we protect the environment, reduce South Africa’s greenhouse emissions and conserve much needed energy for our national electricity grid. I would personally like to thank every student and teacher who participated for contributing to a cleaner and greener future for our nation,” says Jhetam. “While every effort made by each participating learner is of value, special mention must be made of Kloof Primary School in Kwa-Zulu Natal for consistently topping the list of winners in this competition. I can honestly say that this faculty embodies the recycling values we hope to instill in the future generations of our country. To date, this school alone has recycled 179 271kgs of glass,” adds Jhetam. As a nation we consume 3 million tons of glass packaging annually but only need to produce 1 million tons as a direct result of not only our advanced returnable system, but also our country’s intensive recycling efforts. There can be no doubt that the sterling efforts of the participating schools made a truly worthy contribution to this achievement. “With over a billion bottles being recycled in the past year, and a recycling rate of 40.9% we can certainly say that South Africans from all walks of life are ensuring that glass is being diverted from our landfills at an increasingly rapid rate. 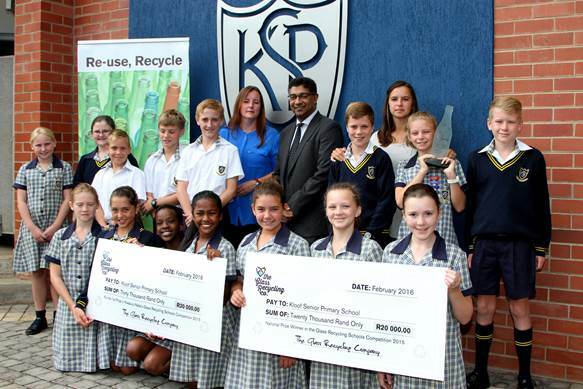 As a result of the Annual Glass Recycling Schools Competition, the youth of our country are also playing their part and of this we are truly proud,” concludes Jhetam. The nine winning schools were presented with a total of R333 516 in prize money, which means that not only does the environment benefit, but the schools and their pupils do too. 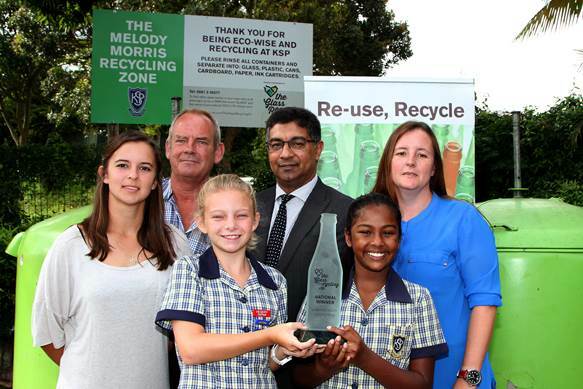 Should you wish to enter your school into the competition for 2016, all you need to do is request a TGRC glass bank for the property so that leaners have a place to deposit their glass bottles and jars for recycling. Simply visit the recycling at home, school or business page for more information on how to educate and encourage young consumers to ‘recover, reuse and recycle’, so that we can leave a cleaner and greener legacy to the South Africa of tomorrow.